The almost daily workings of a less than famous illustrator. What can I say, I'm a sucker for Lovecraft. 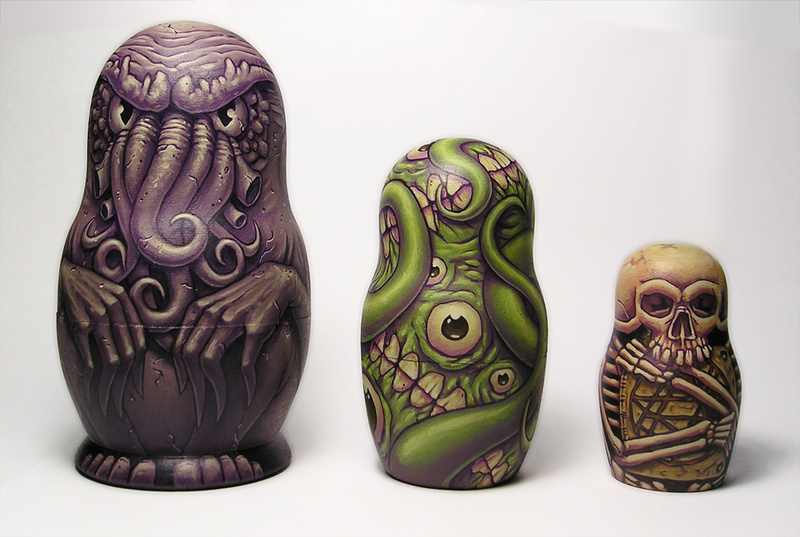 These little beauties are my submission to next month's "Doll Haus" nesting dolls group show at Rothick Art Haus. 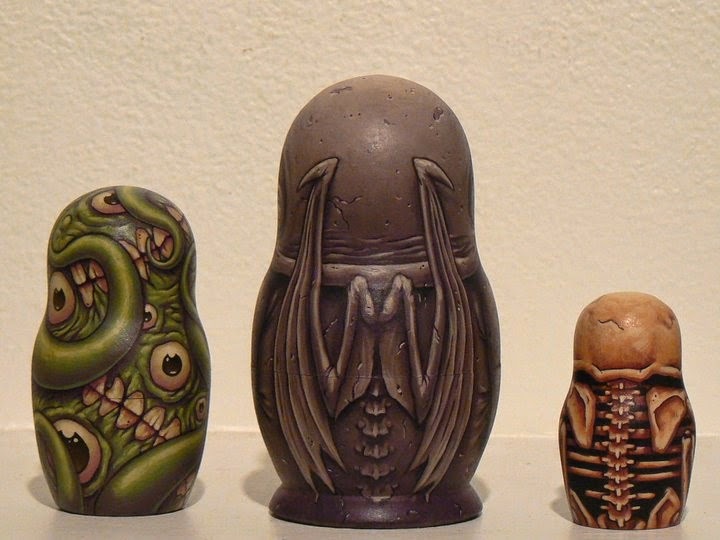 From largest to smallest we've got an Idol to the dread Cthulhu himself, a Shogoth, and a cultist (still clutching his Necronomicon). I strongly urge anyone in the LA / Anahiem area to come check out the show April 9th. The work I've seen so far has been excellent, and Rothick always puts on an amazing show. Thanks man! The link is much appreciated, and I can't wait to see the article. Let me know when it's up. Awesome blog, by the way. The very first post I saw was about Cthulhu branded beer, which I will now spend the afternoon searching for. So, would you ever think of making these to sell? What they said, I want to buy a set!!! Wow! I adore these! Definitely let everyone know if you decide to make sets for sale!! Thanks everybody! and a huge thanks to everyone that's reposted this! My blog has gotten something like 280 hits so far today, which for comparison is what this blog usually averages in a month! At present I don't have any plans to mass produce these, but it's great to hear that the interest is out there. I'm definitely interested in making toys, and it would be awesome to do a run of something like this in the future. If anyone knows someone that does this sort of thing I'd love to hear from them. Well, if ever you do manufacture these, do let me know! They are wonderful! Awesome Cthulhu-ness from Cuddles (fan name) in Scotland! Good luck in the show! I tried to leave one comment but not sure if it got there or not lol. We just saw your picture today of these and sincerely hope you consider making more for sale because we would absolutely purchase them for our collection. Awesome work. Okay, I'm in love--these are AMAZING! I'm a big Lovecraft fan, too, but the contrast... comforting fun... in monster form--fabulous! I will strongly recommend you to do a kickstarter to mass produce these. I will back you up. I agree with Randall WiseWolf Padilla. If you decide to do this, my support is yours as well. Agree'd. I would purchase as well..
Just discovered these. I agree with Alissia 07/10/12 and Randall 08/26/12. I would definitely support this and buy at least two sets (one to for me and at least one for a friend.) Please keep me posted if you go the route of production for sale. Very, very cool. I would also very much be interested in buying a few sets of these! - Great work! I would order a set of these in a minute. Absolutely; I'd be all over a kickstarter for these too! I come back every once in a while to see if there's been any mention of one so I don't miss it. just spotted these somewhere else (with link back here) after a year, these still look AWESOME!!! These are amazing. You totally need to get a kickstarter going. I would totally buy some of these! Yup...with my heart fluttering in my chest I was digging for my wallet as fast as I could before realizing these weren't available for purchase...yet ;) Hearts fell in love but are breaking everywhere right now... please give them hope and purpose... please find a way to get these out for sale! PLEASE do you know how much money you could make? 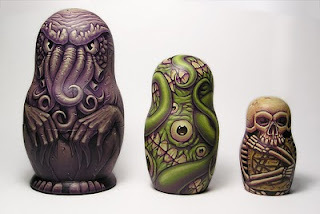 The Lovecraftian fiends (ie ME) would kill for these... I WILL NOT GO INSANE PROPERLY TILL I HAVE THEM! These would definitely sell in the UK too!!! could you show oss the back of the dolls? I'm wondering how these fared in the Rothick show back when you made them? Hello Everyone, thanks again for all of your comments, it really means a lot to me to hear from people who like my work. Martin - Unfortunately, this set has already been sold. Chris - The set did really well in the original show. From what I remember the pieces actually sold before the doors even opened. Anon - I'll see if I can track down a shot of the back of the dolls. If I find one I'll add it to this post. Thanks again everyone! You guys are awesome! After being told about this by a friend, there are five us interested in purchasing one or more sets. We live in Brazil and its success would be huge here. Did you ever start reproducing these? Where are all your paintings? I've finally got myself a fancy new website! So if you'd like to see my work sans-doodles check out my website here. This blog will still be your source for news, previews of what I'm working on, and the "Word of the Day" project. So stay tuned! A 6'5", 220 pound, bearded half-yeti, trying to make a living slinging paint in the city of angels. All works shown are copyright Mike Bilz unless otherwise noted.